Lise Meitner was an Austrian-Swedish nuclear physicist. Meitner was an Austrian-Swedish physicist who discovered nuclear fission with Otto Hahn and Fritz Strassmann when they bombarded uranium with neutrons. She was the one who identified that fission had occurred after examining the data. She also discovered the first long lasting isotope of the element protactinium with Otto Hahn. Element 109, meitnerium was named in her honor. Lise Meitner did not join the efforts to create an atomic bomb and was saddened that her work was used to make destructive weapons. She continued nuclear research, eventually helping to build the first nuclear reactor in Sweden. Meitner was not recognized for her part in the discovery of fission — Hahn won the Nobel Prize in Chemistry in 1944 for the achievement. 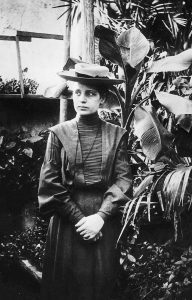 Lise Meitner’s accomplishment was marginalized for multiple reasons, including political influence, Meitner’s gender, and her profession as a physicist, rather than as a chemist. Interested in learning more? The National Science Foundation sponsored a talk by Ruth Lewin Sime, author of the biography “Lise Meitner: A Life in Physics”, in which Ruth describes more of Lise’s achievements.